This post is going to be about a few different topics – Charley and Me, Baltimore, Baseball, Brawls, Politics, Civility, the Media, National Values, Umbrellas and Flags because today is Flag Day here in the US of A. I promise I’ll tie them all neatly together in the end and hopefully, you’ll still be with me when I do. Last week Charley and I travelled to Baltimore, Maryland. We go there on a regular basis because Charley is involved in clinical studies to find a cure for cancer. He’s been in some amazing studies and although he has an aggressive form of prostate cancer, after nine long years, he’s now in remission. Well, as some of you know, we try to make these trips more than just a hospital visit for tests and scans. We love baseball. If the Baltimore Orioles are playing at home, we get tickets and spend a great evening eating hot dogs and drinking beer and cheering the players on. 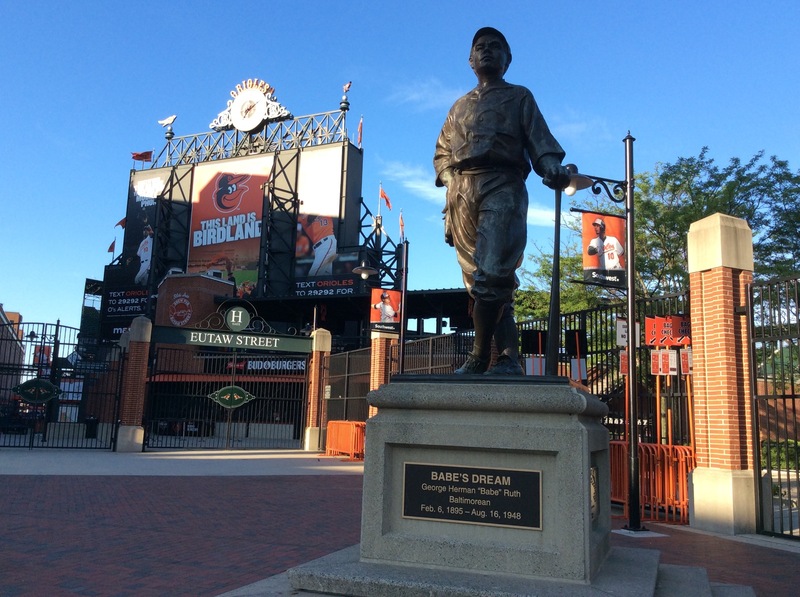 So, last Tuesday night we found ourselves at Camden Yards, the home of the Orioles. At the gates, they were giving away free orange and black (Oriole’s colors) golf umbrellas. The weather was beautiful and fans were milling around buying souvenirs and getting dinner and snacks from the vendors before heading to their seats. In the stands, a cool breeze blew in from the Inner Harbor. The game started off with The Star Spangled Banner. The tradition of performing this National Anthem before every ball game began in World War II. Warning: at Camden Yards, when you get to the line in the song, “O say does that Star Spangled Banner yet wave”, everybody hollers out the “O” as loudly as they can. (Because of the O in Orioles). It scared the crap out of me the first time this happened. I was not prepared. I now yell “O” right along with everyone else. I just make sure I’m in the Oriole’s Ball Park, as this would not go over very well at Yankee Stadium or Boston’s Fenway Park. Now a very short American History Lesson for those of you still with me. Five years ago, when Charley and I were staying in Baltimore for a few weeks, we took a boat ride through the Harbor to Fort McHenry. It was a beautiful April day and we took advantage of the unseasonably warm weather to wander around the Fort and speak with the docents. Inside the building we viewed a documentary of the famous battle waged there on September 13, 1814. The film ended with the movie screen lifting slowly, revealing a window to the outside and a view of the flag that now flies over Fort McHenry. During the War of 1812, Fort McHenry was bombarded by British Ships. The Citizens of Baltimore and the US Army stationed there held off the attack and the next morning the American Flag was still flying over the Fort. A poet, Francis Scott Key had watched the battle from the vantage point of a British Ship where he was being detained. 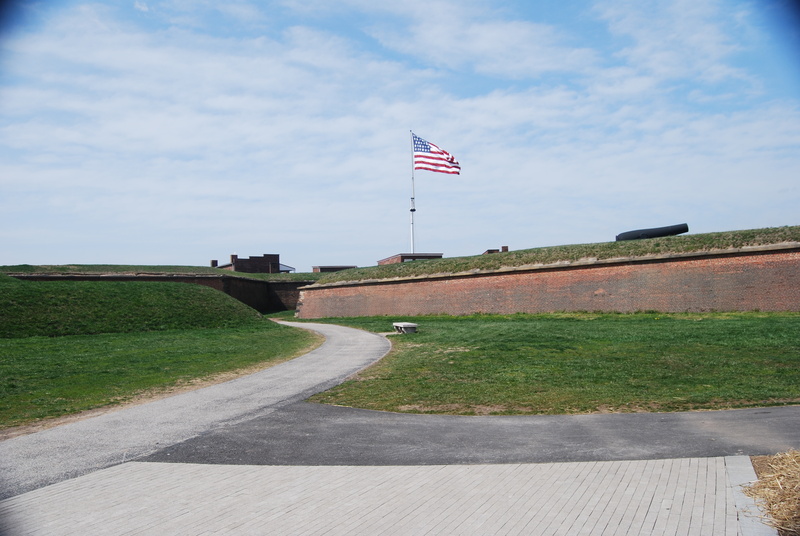 Upon seeing the US Flag flying triumphantly over the Fort the next morning, he was inspired to write a poem called “Defense of Fort McHenry” which later became the lyrics to The Star Spangled Banner which was set to the music of a song by composer John Stafford Smith. The original flag, known as the Star-Spangled Banner which was flying over the Fort that morning had been made by Mary Young Pickersgill and other seamstresses from Baltimore. It now is displayed in the National Museum of American History in the Smithsonian Institution. Lesson done. Save your questions for later. I still have a blog post to finish before Flag Day, 2016 is over. Here’s a riddle for you: When does a baseball game become a wrestling match? The game started as Charley and I chowed down on our beers and hot dogs.The people sitting next to us were avid fans, interesting and fun. In the first four and a half innings, we saw some great defensive plays. Lorenzo Cain, center fielder for Kansas City, caught a ball headed out of the park by jumping like Superman taking flight; throwing himself against the top of the back wall and catching it at the last second in his outstretched glove. It’s a wonder he didn’t break his ribs! Fans from both sides whole-heartedly applauded the play. In the bottom of the fifth inning, the game suddenly turned into a melee. The Kansas Royals’ pitcher, Yordano Ventura, purposely threw a 90 mile an hour pitch right at the Baltimore batter, Manny Machado. Machado reacted by turning quickly, causing the ball to strike him in the back. Ouch! He threw his batting helmet down and stormed the pitcher’s mound, getting in a few good shots before Ventura tackled him to the ground. The benches emptied. The area between the mound and first base became a pile of bodies on top of the two combatants, all this while the fans were in a frenzy standing and chanting, “Manneee! Mannnee!” It took some time for the players to get disentangled. Manny was pulled off the field still yelling at Yordano who was now surrounded by officials and players. Both were ejected from the game and replaced with subs. They were later to receive suspensions for their actions. Machado must sit out four games (which he’s appealing) while Yordano will be benched for nine. After the incident Baltimore scored four more times and the Orioles ended up winning 9-1. It’s never a good strategy to get the other side riled up. It almost always backfires. It’s a male macho thing having to do with pumped-up adrenalin that I don’t care to psychoanalyze at this time. (Or any other time for that matter.) And even though Manny had played only 5 of the 9 innings, he was selected as Player of the Game. The next morning we were walking through the airport with our new golf umbrellas and people were asking us to tell them about the “Brawl Game”. Having some extra time before we had to board, we went to the Silver Diner for breakfast and sat at the bar looking up at a television monitor replaying the brawl. On another monitor, Hillary Clinton was giving a victory speech to her followers after winning most of that Tuesday’s State Primaries. Trump was on another screen whining about his racial slurs being misconstrued and how he expects the Republican Party to unite behind him and “Get over it”. “It” being every stupid thing that has regurgitated from his “pie hole” since the beginning of this political farce. And then commentators turned to the topic of “Civility in politics”. I turned and looked at Charley in utter disbelief. Seriously folks! Civility in Politics?!!!! 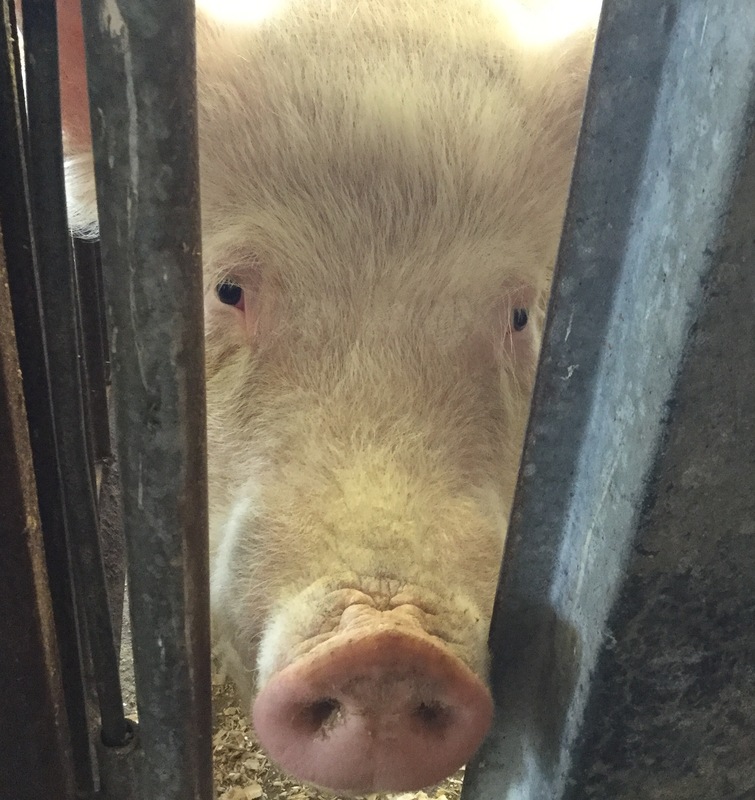 That pig’s been out of the barn for years! Doesn’t anybody remember Sarah Palin? Just as “there’s no crying in baseball”, “there’s no civility in politics. It’s just another Brawl Game. It’s the fodder which makes up our daily breaking news here in the states. And elsewhere there are people trying to escape wars and disasters; parents trying to gain a better life for their children; women and men, like Charley, volunteering for clinical studies to find a cure for some of the horrible diseases that deprive us of our loved ones. Yet, these news items were what we were greeted with by the media on a Wednesday morning after the Tuesday night “wrestling matches”. Please know that we have good, compassionate leaders in this country, just as there are in other countries around the world. People who have become our Statesmen and Stateswomen. People we are proud of who represent us with grace and good will in the best and worst of times. They’ve done this through acting civilly and truly caring about the needs of the people. All people. So, when does a baseball game become a wrestling match? I would guess, the same time a political campaign becomes an ugly brawl. The consequences will be lasting for everyone. Just ask Ventura’s team mates, especially the ones who’ll be hit by fast balls in retaliation for all of the players on all of the opposing teams he repeatedly has beaned now and in the past. When I was a child, I remember vividly that the first thing on television in the morning was a test pattern and then the American Flag with the Star Spangled Banner playing in the background. We used to be a country worthy of the words in that Anthem. Many of us still take these words very seriously. We want other countries to see we have leaders who are intelligent, trustworthy and compassionate. Americans truly want these qualities in our leaders, believe me. I am not looking forward to the months ahead. Just think of what we’ll be subjected to on the news when the National Presidential Conventions begin at the end of July – and then on into the November election? There will be no civility in politics, just a never-ending Brawl Game of epic proportions, providing the media with much in “entertainment value” to boost their ratings. And blood will be spilled and there will be both whining and crying and gnashing of false teeth. And the consequences of it all will reign down upon the multitudes and no over-sized golf umbrellas will protect us from that downpour. The candidates will never be given the suspensions they well-deserve, but we will all be held in a state of suspension until we can find a path to disentangle ourselves out from under what this ugly brand of politics has piled upon us. Oh, I can see it all now and I will say, I don’t like what I see. A Peaceful Flag Day to everyone. I also won’t like most of I see, but what can be done! You might hear that everything depends on you, but I hardly believe it, there are too many things we can’t control or avoid. Dear Claire, your post is a good lesson to me, since I know not much about US, it is a fard country mostly advertised in American blockbusters which are in our cinema fashion. We know most of your actors, but nothing about real life in USA. Such people like you can open the curtain and let us in. It’s treasure! Thank you! I would say that we have to find enough strength to enjoy every little moment of our lives! That’s important! Thank you, Clare, for you too! Some pretty heart felt sentiments, there Clare. Over here, we’ve got the referendum to decide if we stay in the EU or leave. Both sides are becoming increasingly vociferous in their outpourings of untruths, attacking the other side – and generally treating us, the electorate, as if we are stupid, unthinking, children. It is so utterly depressing. I’ve been watching this situation as it moves along. The news seems to have taken our penchant for drama and made facts a secondary matter in its reporting. I had no intention to get anywhere near political discussions in my blog – but it’s obvious that this has gone way past politics here in the US. I think our leaders would do well to take some time to read a few blogs from people around the world who are thinking and communicating with each other about their leaders’ actions. We certainly are in need of leaders who do not just see themselves as sheep herders. It is depressing all around. I think a major part of the problem is that the political leaders have no contact with ordinary people and have no idea of what it is like to have a take home wage that barely covers essentials or to be unable to buy a house or find a job… Nor do they seem to understand the majority of people want to live in peace and harmony with their neighbours (whether next door, next street or next door country) regardless of colour, race, religious persuasion or sexual preferences. Their main priority is to hang on to power and they are surrounded by people who tell them what they want to hear. I believe in the 1940s and 50s people went into politics in this country because they genuinely wanted to do good, to improve life for the people. Now, people go into politics purely to serve their own ends. I don’t know how we can begin to change things. I enjoyed sharing your trip to Baltimore. From the pictures of Charlie, it looks like he is very healthy. It must be a great relief to you and him. If you get a chance, please post at the Salon tomorrow. Clare the day the Salon gets the best traffic is Wednesday. I lost track of the days and finally decided to post on Tuesday because it was Flag Day. I’ll remember next week. Over here in Britain, and as regards our participation in the European Union, we’re going through many further displays of evidence that politics is in a degenerative state. People have lost trust in the institutions and the established political parties, and no longer know to whom power should advocated. The Centre Right no longer so much seems the place where the mass of people instinctually gravitate, and so we see, just as in the U.S., more of a polarization to what by comparison are the extremes. My own view is that things will get worse before they better, as the birthing of new paradigms is seldom painless. I agree, it will get worse and either we learn from history or take our consequences. And I realize the problems with our leaders and potential leaders here in the United States are also world-wide problems. I can only hope we have a rebirth and it makes us united within a better, kinder nation (world). I will live in a cocoon during that election period. I can’t stand it now. It’s such a bad model for kids. I think we should suspend politicians when they get nasty. Yes! Suspension along with assigned public service. Maybe then, they would be more in touch with the citizens of this country and their needs. Of course I loved this post. The history, which I am largely ignorant of (and the British bit is told a little differently in my old country – that’s the way with history – it’s all in the telling and by the way I rather think the American telling is more accurate in this case … after all we were fighting all-comers at the time and needed to keep convincing ourselves it was worthwhile); the ball game – I saw the brawl on the news … I’d have waved to you if I’d known); Baltimore itself where I have a cousin and his little family and fully intend on visiting but had no idea really what to expect; the politics of it all. It is a Brawl Game, you are right. And this particular election will be bloody and foul mouthed because one of the candidates is nothing more than a trumped up street fighter. But don’t be alarmed. Really the rest of the world (or the little bit that I am most familiar with) has it’s own farce’s being played out. In France we have le panda geant – M. Hollande is the most unpopular president of all time and has made some quite farcical errors of judgement (though I do think he handled the crises of Charlie Hebdo and the second Paris massacre with dignity, decorum and all round appropriateness) but the truth is that if France swings next year it may well elect itself a fascist leader in the shape of the most odious Marine le Penn. Sarcozi who was outed in 2012 may well yet step back into the arena with a chance of being reunited with the presidency. A farce indeed. And in the UK – the European in or out referendum …. do NOT get me started on the appalling drivel that the exit brigade are spouting which is all about immigration. In fact in a marvellous moment my husband, in full cry about Trump and Boris called them collectively Doris. So they are now Doris Trumpton in our house – both bigots, both fools, both utterly self-serving and neither of them worthy of the title ‘statesman’. The USA has much to be proud of, including in its great leaders. And I am proud to be here. So there! Thank you – you have made me so welcome here. Politics is a crazy business that turns the most normal into power-crazed morons so there is little hope when you are one to start with! Sadly, I think it is impossible to avoid talking about politics just now even when you (and I) have a vow of silence on the matter. I am deliberately keeping my feelings about the European vote to myself but when i see what people I thought were intelligent friends of mine back home are posting on facebook … it makes me weep. Oh, I’ve learned to stay as far away from Face Book comments as possible. Blogger conversations have an element of sanity to them that leads to making me “Thinks” deeper into a topic. I am always open to someone else’s perspective, especially people of different backgrounds and nationalities. I realize there is so much I don’t know and want to know. In my own heart, I know what’s right and what’s wrong for me, but I welcome the opportunity to listen to what is in other people’s hearts. I would banish FaceBook from my life except that I have four daughters on different continents and they like me to be on it. That said, I am like Ming in Flash Gordon – viewing the world from above on my frightfully high-tec (!) screen and never making any comment. YOu are right though, here in the blogsphere one can have a far more in depth and searching conversation that stretches one and educates. I likee very much! The problem with Boris is that he’s such a very clever ‘fool’, Osyth. In fact, he could be Prime Minister before the summer ends, as I’m sure you’re aware. Tell me, is it really possible that Le Penn could be elected next year? That’s a very worrying prospect if it’s true – far moreso than Boris being PM here. Thanks Osyth – tell me, if you would, should Britain leave the EU (as now looks more likely than not), could France follow suit if a referendum were granted to the people? I love the pictures and the stories! It is so wise and so much fun that you make the trips about other things and have some fun and adventure!Charley is amazing and an inspiration and so are you! Sounds like a great time going to see baseball games! You are a gorgeous couple Clare! How brilliantly you’ve interwoven so many themes. What an interesting and informative post. Thanks Claire. As I’ve said, I never know what my next post will be until things happen and motivate me to write. Obviously lots happened last week, so everything ended up on paper! Maybe this will be a quiet week ????? Thank you. Charley says “Thanks” and we love your new word. And we want you to have a lovely day, too. You’re good. I actually almost got lost, myself! I’m going to show Charley your YouTube Boogey Dance and see if he’ll boogey down with me and the cats! You sure crammed, err I mean expertly intertwined, a lot of good stuff into a single entertaining post. Thank you! Thanks, Russ. I am good at expertly intertwining, but sometimes I do get lost in my own words! You’re welcome. I always wonder how many more good people would go into politics if it were not such a nasty, ugly business. As for Baltimore, I would have been one of those people asking about the game in the airport! Funny enough, I have been to about half of the ballparks. One of the ones I haven’t been to is Baltimore, despite many trips to the city (and regularly flying in and out of there to visit Paul’s family). Paul even had his bachelor party there! I guess it’s just an instance of it being so easy to go, that I never do! I know what you mean. The town where I was born is the home of the Paw Sox and we live a little over an hour from Boston .I’ve never been to a Boston Red Sox Game at Fenway! I’ve been to a Giants Game in San Francisco, Diamondback games in Arizona, Yankee Games at the old stadium and lots of Games at Camden Yards. But I’ve never been to Fenway! That’s exactly my Orioles issue! Funny enough, I’ve been to Fenway – but for a football game, not a baseball game. I don’t get to count it until I see an actual baseball game! There are a couple other baseball stadiums like that – I have been to the stadium, but not for baseball. Well, I’ve signed Charley and me up for a game and a tour of Fenway Park next week! Yay! It was organized by the OLLI group at the University of RI. Now it’s your turn. We’re thinking of taking in another game in early August at Camden Yards. Oh, that sounds like it will be great – the tour alone would be fun, but add in a game and it’s even better! I don’t think we’re going to be back in Baltimore until the end of July at this point. I will have to see if the O’s are in town! I thought it was a good idea. Usually it is really too expensive to attend a game at Fenway. 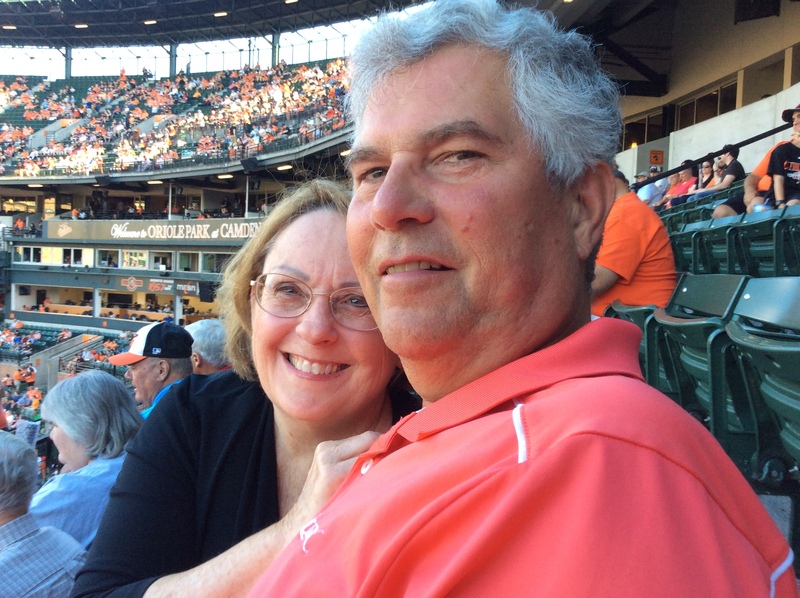 That’s why we love Camden Yards – reasonable and great seats! But this was a package for seniors, so I jumped at it. Hopefully the O’s will be going strong. And maybe Manny will be out there. Maybe they’ll be playing Kansas again? Yikes! American politics has become really a wearing situation and I shudder at the coming months, on the positive side, it’s such good news that Charly’s cancer is in remission and he’s using the experience for positive things. Brilliant photos. Thanks Jacqueline, We are really feeling the pain of embarrassment here in the US every time he opens his mouth. He picks on people he feels are inferior to him and that is just about everybody because he is rich and entitled. If the rich 1% in this country used even a small portion of their money to help with education or the arts or medical research, all of our problems would be well on the way to being solved. Greed is their religion! Yes, Charley is doing well and that is a relief as you can imagine. I hope all is well and very peaceful in Dubai. We’ve had another mass shooting this week in Florida. My head aches with the thought of all the things that need to be changed in this country. Brilliant piece of writing. Its a travel blog and political satire all rolled into one. Sometimes these ” eye views” are so much more informative than the heavy literature that we read. I will read your post to learn more of Charley’s journey. I like his title. I have seen my mother go thru breast cancer twice so I know of what you speak, fortunately she too is still with us. You’re most welcome and you are right, there can never be enough prayers. May the miracle continue. Thank you, Deb. My father died of prostate cancer and my mother had breast cancer twice, just like your mom. We are truly hoping that Charley helps in finding a cure which will benefit all cancer patients so we don’t have to lose people we love to this disease. Roxie is right here watching me visit you. She thinks you may have some cat videos on your site and is very excited! I’m going to take a break from reading now and at least try to get a short post out there??????? She’s been hysterically happy because we’ve spent most of the day in the gazebo. She sits in the chair and stares adoringly across at him. She does have a gray felt mouse she brings to him every day and he woke up with it next to him this morning. It’s filthy! But I guess that makes it even more special ! I’ve actually been able to do the Sunday crossword and answer comments without the constant yowling in my ear. It’s just another Brawl Game. Isn’t that the truth!!! Oh Ethel, I loved this whole thing! you’re so right, we WANT civil leaders again!! We WANT to be proud of them again! I miss the Star Spangled Banner first thing in the morning!! How exciting it must have been to see the flag revealed at the end of that movie!! Did you get chills?? Lucy, Charley and I didn’t realize the screen was in front of a massive window. When the screen slowly rolled up at the end, revealing the flag outside the building, the Star-Spangled Banner was playing . And yes, it was one of those Ah ha moments ! Wow! That gives me chills! I can imagine the majesty of it! And it was my 62nd birthday, so I was a senior citizen and I got a free pass to National Parks and Monuments of the rest of my life. Did you know everyone in the US can apply for that? No, I believe it was the lime apricot Fanta you gave up. No worries! Whew!! SAved by the flavor! Thanks, bestie! Just the facts, Ma’am,, just the facts! 😀 Have I told you today, I love you, Ethel?? Of course she does!! I’m stockpiling tuna for her royal visit! Congrats to Charlie on being in remission!! I have a feeling your love has a LOT to do with that!! Oh Ethel, Charlie is so blessed to have you at his side, thru everything! Patients in any healthcare setting need an advocate! That is so important! As you said, the patient is bearing the physical pain, and sometimes that takes all your energy. No one should ever have to deal with any kind of illness alone. I am very blessed to go on this journey with him, but it’s not what I envisioned when we married. I thought we’d travel the world although we do try to make adventures at every opportunity. You are together, and enjoying life as you have it. I think that’s terrific. Well, we did go to Epcot!? Oh, no1 That song1 Not that song! Yayyyyy! I love the Giants! We were at a game in San Francisco a year ago in April. Buster Posey catching, Bumgardner pitching. What’s better than that! Music to my ears! Hope you guys came out here while we had some of our great weather patterns. Some folks come out right after a nice hot spell and only so the foggy side of the city. You picked a great game to go to with Bum pitching. It really was a great game – I love Bum and Posey. They’re an awesome team. The weather was perfect and we went on down to Monterey to visit the aquarium and that was magnificent. Great post, Clare, and a lot of food for thought. You and Charley have fun together and that’s what matters. I love the photos and the way you share the places you go. It’s also good to hear another person’s thoughts, although we may not all agree. Our blogs are the place where we should feel free to say whatever we please. Awesome post, Clare! When other bloggers write a post about where they live or a trip they’ve taken, I can’t get enough. I want to know everything about that place. It’s the reason I started writing about my yard and gardens, home town and the trips we take.It seems other people feel the same as I do and love learning more about the people who we chat with on a regular basis. Jo, I would love it if you ran for office . You are a true optimist and would drop kick us all into the right end zone! I am losing my optimism every day at this point. It isn’t so much the dummy as the people who follow him blindly and don’t realize he could care less about the middle and lower classes. The people who cheer the bully on, joyful that they are not the victim of the moment. But they will become his next victims and they can’t even see it. Stepford! You are so right, Clare. It really has explained to me the appeal of Hitler. I have been doing lots of Facebook posts about him, but in reasoned ways woo over some conservative friends. The poor blue-collar folks will truly lose under him. He has no clue what their lives are like and just parrots Hannity, Beck, and Limbaugh and wants the benefits for millionaires like him. Don’t love Hilary but hope she will follow up on some of Bernie’s ideals. My faith in Hilary is gaining. Or maybe it’s just a residual numbing effect caused by my disgust of the other candidate? Jo, do you have an escape plan if he gets in? Rio’s looking good right now in spite of all their internal problems!!!!! Canada? At least we’d be able to drink the water! I have to admit they really have been out to get her. But I don’t like the Foundation “favors.” On the other hand Bengazi lawsuit now? Purely evil politics! Yeah, Canada! “Oh Ca na da! La,la,la,la,la,la, la………” Start practicing! When we were dating, we used to watch hockey night in Canada. Uh oh, where did I leave that hockey stick? We may need it! Don’t worry, I’ve got tons of golf clubs around here. We’re armed and ready! PS I love maple sugar candy. Win-win! I was thinking of McCarthy and George Wallace and how they led people on with their hate until the saner minds stood up and said “Enough!” Do you realize that we are now the saner minds and your blog posts are part of that “Enough”! which may put a halt to all of this stupidity? We’re clinging on to the edge of the cliff. Don’t let go!!!! Those are also both apt comparisons. Pretty scary. But someone stood up to them in the end, so Doug could be right. And he has a direct contact to a higher being, so we need to trust his opinion.